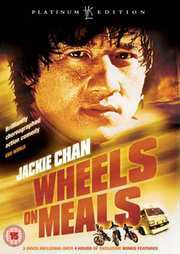 While serving up Chinese fast-food from their high-tech lunch truck in the busy, picturesque squares of Barcelona, Thomas (Jackie Chan) and David (Yuen Biao) inadvertently become involved with a beautiful pickpocket, Sylvia (Spanish actress and former Miss Spain, Lola Forner). To the trio`s dismay, Sylvia`s illegal activities have attracted the unwelcome attention of Moby (Sammo Hung), a bumbling novice detective. But when Sylvia is kidnapped, it is revealed she is actually a wealthy heiress and Thomas and David are forced to team up with Moby in wild chase to rescue her from her abductors before it is too late! Audio commentary by Hong Kong film expert, Bey Logan. On Giants` Shoulders - interview with director/star, Sammo Hung. Born To Fight - featurette with action-icon, Yuen Biao.Rush And Roll - with Rush Hour 1 and 2 director, Brett Ratner. 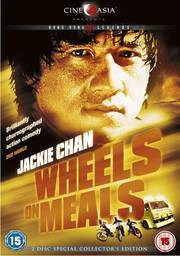 The Inside Track - with action-director, stuntman and veteran Jackie Chan/Sammo Hung collaborator, Stanley Tong. Jet Fighter - an interview and teaching seminar with undefeated kickboxing champion, Benny "The Jet" Urquidez. `King of the Ring` featurette with Black Belt Hall of Fame Karate champion, Keith Vitali. Rare outtakes. Trailer gallery.